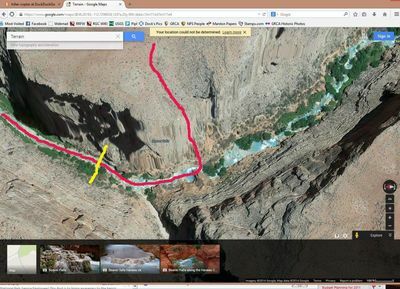 The pink line in the indefinite boundary between Grand Canyon National Park and the Havasupai Nation. Park visitors are able to visit the water features at the confluence with Beaver Creek and roughly 400 feet further up Havasu Creek above the confluence. Anyone asking for $44 per river runner at the location of the yellow line in order for visitors to proceed upstream to the confluence with Beaver Creek is doing so illegally.